The next VE testing session will be Wednesday, April 17, 2019 beginning promptly at 7:00 p.m. at Christ Episcopal Church School. 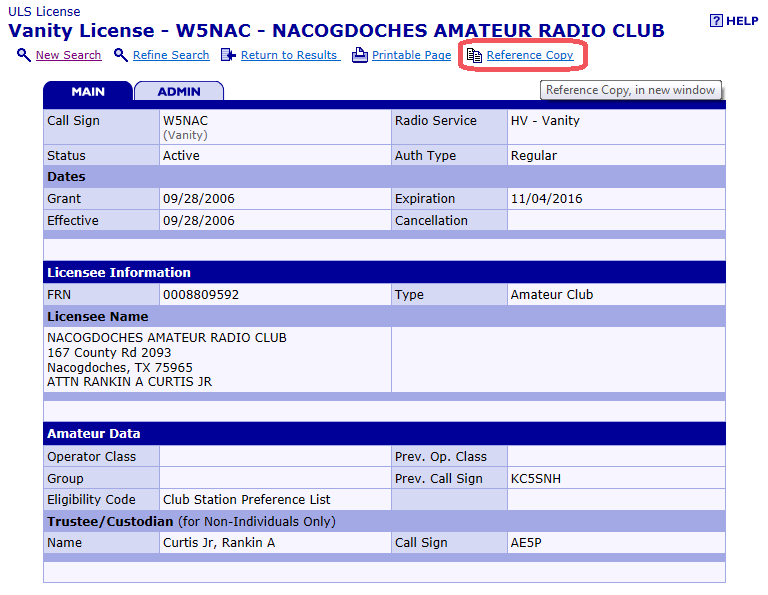 The next monthly meeting of the Nacogdoches Amateur Radio Club will be held on Wednesday, May 1, 2019 beginning at 7:00 p.m. in the School Lunch Room at Christ Episcopal Church. All with an interest in Amateur Radio are welcome to attend. At its annual meeting in January, the ARRL Board of Directors adopted a new ARES plan intended to provide ARES with a clearly defined mission, goals, and objectives; specific training requirements, and a system for consistent reporting and record-keeping. View the 2019 ARES Plan here. 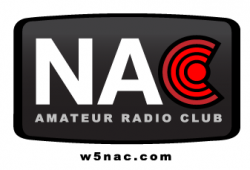 KE5PQJ’s program at the August NARC Meeting – Decoding P25 with your PC. Download the P25 PDF for the links that will be referenced in the program. We added a new page for ARES/RACES resources. Thanks to AE5P for spearheading a newly updated frequency list for repeaters and simplex operation in the East Texas area. The club recently acquired two new Yaesu DR-1X repeaters, funded by NCEC, to replace the existing equipment at the City Communications site on Powers Street. 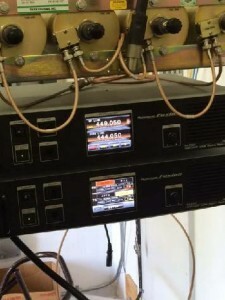 This includes the 146.840 VHF repeater and the 440.050 UHF repeater. The Yaesu DR-1X is a very versatile synthesized radio, able to operate on either 2M or 70CM, and is digital capable. We have both repeaters currently configured to accept either analog (FM) or digital input, and to transmit analog FM. Digital input is automatically converted to analog. As both repeaters are identical, this also provides backup if one unit should fail. The repeater controller logic is built into the radio so an external controller is not required. As those using the new repeaters have already noticed, there is no courtesy tone, nor is there voice ID. All identification is in CW. The installation of the new equipment was made April 22. 2015 with a number of club members participating. Many thanks to Rusty KD5GEN, Tom W5TV, Mike KF5KEY, Robert KC4LUY, and special thanks to Tim KE5PQJ who brought with him a couple of strong young guys from Commercial Bank who took care of the heavy lifting. 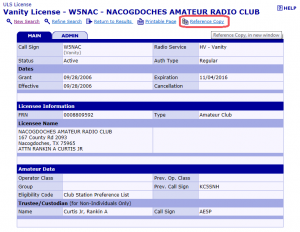 This information appears in the May 2015 edition of the Nacogdoches Amateur Radio Club Newsletter. View the entire newsletter here. 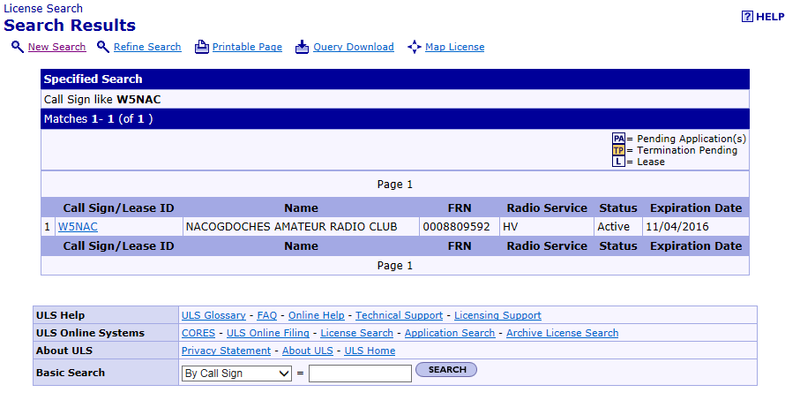 Earlier today N5DUX sent an email about wanting to print a copy of an Amateur Radio License on high quality paper. It seems that the FCC no longer cares that people take pride in attaining their license and has stopped providing the license at all. To print a Reference Copy of your license, you will need to find yourself in the FCC’s database. 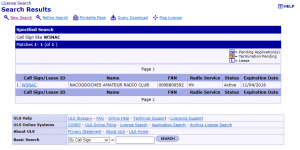 Go to http://wireless2.fcc.gov/UlsApp/UlsSearch/searchLicense.jsp and enter your callsign in the box in the middle of the page, then click the “Search” button. After much whirring and clicking a result page will appear. Click on the Callsign on the left side of the table. Finally, click on the Reference Copy link at the top of the new page. Your browser will either open your license in a PDF or ask you what you want to do with the file. This reference copy has a watermark that clearly tells everyone that it is a REFERENCE COPY. There is a way to get a copy that does not have the watermark. It is a little more involved, so pay attention…..
Now, go to this page and change the licKey to the one that you found above. Now you have a reference copy without the watermark.